HSBC proudly present the Colombo Fashion Week festive from 11th to 14th March 2015, this Colombo Fashion Week Festive is a 12 years consecutive event in Colombo Event Calendar. 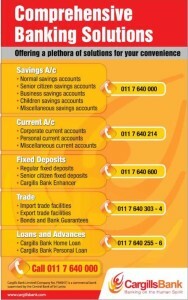 The Cargills Bank is one of the banking services from the Cargills Ceylon PLC, offers range of banking services to Srilankan at great manner. 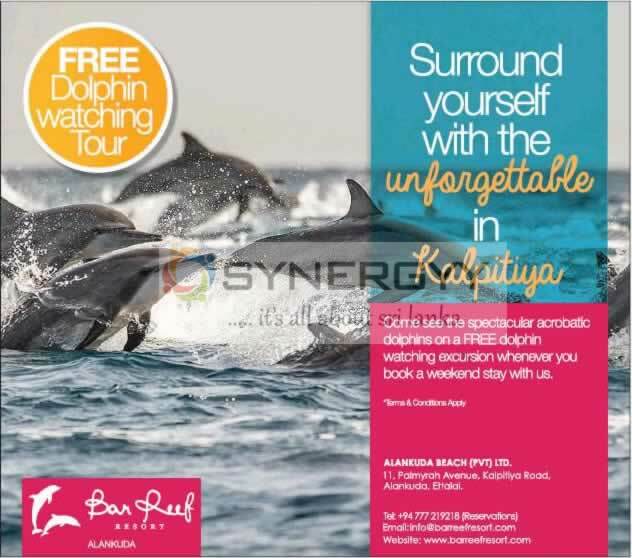 Surround yourself with the unforgettable in Kalpitiya, come see the spectacular acrobatic dolphins on a FREE dolphin watching excursion whenever you book a weekend stay with us. For more details contact to Alankuda Beach (Pvt) Ltd, 11, Polmyrah Avenue, Kalpitiya Road, Alan kuda, Ettalai. Wildlife and Nature Protection Society of Sri Lanka (Ceylon) announced that WNPS Bungalows in Yala, Wilpattu and Udawalawe is now open for Non members of WNPS at same fee as now and WNPS members will obtain at a special rate. 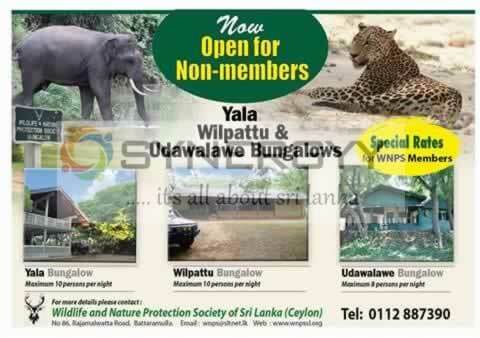 The Bungalows in Yala, Wilpattu are cater upto 10 passengers and Udawalawe for 8 Passengers. Central Bank of Sri Lanka has said that it had instructed all the banks to allow senior citizens who are over 60 years of age to avail them of the special interest scheme meant for them as announced in the interim budget of 2015, with effect from February 1, 2015. Accordingly, senior citizens above the age of 60, who held fixed deposits not exceeding Rs.1 million in aggregate in all banks as at January 31, 2015, would be eligible for an interest rate of 15% per annum. Senior citizens who have reached the age of 60 after January 31, 2015 and hold fixed deposits not exceeding Rs.1 million will also be eligible for the same interest rate. The all new Attrage designed keeping the environmental conscious individual in mind with more mileage to a liter whilst offering the best in unbeatable comfort, uncompromised safety and latest technology. 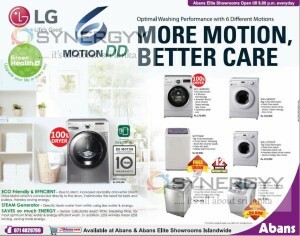 Inverter direct drive motor, Saves energy, less noise. Application forms for admission to Grade 1 – 2016 will be available from Wednesday, 18th February 2015 to Wednesday, 25th February 2015 from 8.00 a.m. to 12.00 noon, on school days only, from the School office. Last day for receiving applications by Registered Post will be Wednesday, 18th March 2015. 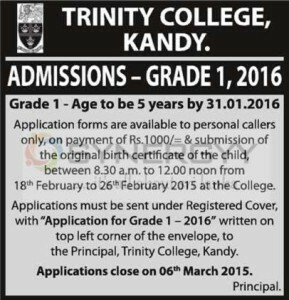 The Kandy Trinity College announces that the Application forms for the grand 1 admission for 2016 (age 5 By 31st January 2016) are available to personal callers only, on payment of Rs.1000/= & submission of the original birth certificate of the child, between 8.30 a.m. to 12.00 noon from 18th February to 26th February 2015 at the College. 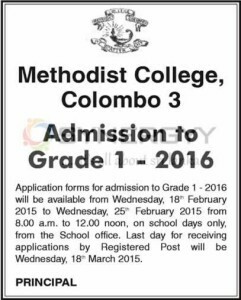 Applications must be sent under Registered Cover, with “Application for Grade 1-2016” written on top left corner of the envelope, to the Principal,Trinity College, Kandy. Applications close on 06th March 2015. The company has allotted 30,874,541 shares, pursuant to the amalgamation. Out of such shares 30,717,222 shares were listed on 11th February 2015. The balance 157,319 shares which have been allotted will be listed upon the company obtaining the approval of the Controller of Exchange (i.e. in respect of non-resident shareholders). CSE announced that the 749,370 ordinary voting shares were listed with effect from 9th February 2015, pursuant to a Scrip Dividend in the proportion of 1:40 ordinary voting shares. The Board of Directors of Textured Jersey Lanka PLC (‘TJL’) has decided to initiate an independent valuation and due diligence study for the purpose of looking at the feasibility of acquiring controlling stakes in Ocean India (Pvt) Ltd (‘Ocean India’) and Quenby Lanka Prints (Pvt) Ltd (‘Quenby Lanka’). This is in pursuance of TJL’s on-going regional expansion and capability enhancement strategy. The decision to proceed with the acquisitions will be subject to findings of the study and the ensuing negotiations between all parties concerned. Brandix Lanka Limited a 30% equity holder in TJL also has equity stakes in both Ocean India and Quenby Lanka. In this context a board subcommittee consisting of the Chairman of TJL-Mr. Bill Lam, two Independent Directors, namely Mr. Amitha Gooneratne and Prof. Malik Ranasinghe, and the Managing Director- Sriyan de Silva Wijeyeratne, have been appointed to oversee the progress of the transaction. 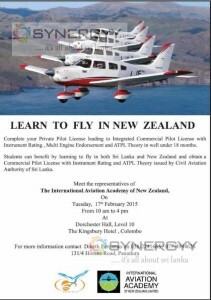 The independent valuation will be conducted by M/s Ernst and Young, Chartered Accountants. Upon the conclusion of the study, if an agreement between all parties is successfully reached, further details including consideration and payment method will be disclosed to the market. The completion of the transaction is also subject to approvals from the Board of Investment of Sri Lanka and the shareholders. Ocean India is a Knit Fabric manufacturer based in Visakhapatnam, India. TJL currently has a technical services agreement with Ocean India that has allowed TJL’s management to familiarize itself with the operations of Ocean India since October 2013. 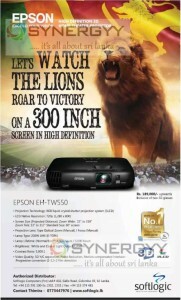 Quenby Lanka is a leading Fabric Printer based in Sri Lanka. Quenby Lanka is currently a strategic vendor to TJL and is located in the Seethawaka International Industrial Park in very close proximity to the TJL production facility. As a strategically located vendor, over the years Quenby Lanka has developed a strong working relationship with TJL. Provided the decision is made to proceed with the two acquisitions, the strong working relationships already established, should help speed up the business integration process and potentially launch TJL to the next level of solution provision, innovation, and regional growth, thereby adding significant long-term value to its shareholders and reinforcing its leadership stature within the fabric industry. The following announcement is made in accordance with Section 8.1 of the Listing Rules of the Colombo Stock Exchange By Cargills (Ceylon) PLC on 13th February 2015. Further to the disclosure dated 25 August 2014, we wish to inform you that on 12 February 2015 International Finance Corporation (IFC) subscribed to an 8% stake in the share capital of Cargills Foods Company (Pvt.) 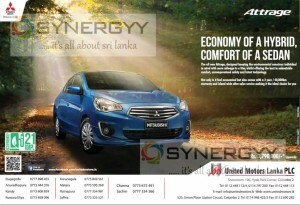 Limited (CFC), wholly owned subsidiary of Cargills (Ceylon) PLC (CCP). Having received IFC Board approval and Conditions for Subscription duly complete, IFC has invested a sum of LKR 2,550Mn (approximately US$ 20Mn) to subscribe for the allotted shares, endorsing a pre-money equity valuation of Rs.29,325Mn for the Group’s Retail business. Cargills Foods Company (Pvt.) Limited carries out the Retail operations of the Cargills Group, made up of the Cargills Food City and Cargills Food City Express supermarket chains. The following voting shares were listed during the period 1st January 2015 to 31st January 2015 consequent to the exercising of options under employee share option schemes. Change the Position of Chairman and Director General – Urban Development Authority We wish to inform you that the Chairman and Director General of this Authority have been resigned from their positions with effect from 13 January 2015 and details of newly appointed Chairman and Director General are as follows. Also, please note that the changes in the Board of Management of Urban Development Authority will be informed as soon as these appointments are made. M&S Announces to CSE that Dr. T. Senthilverl has sold his 15.348% stake of Vidullanka PLC to Aberdeen Holdings (Pvt) Limited on 10th February 2015. This sale has done at 73,251,835 Ordinary Shares at a Price of Rs. 6.00. Further to the previous announcement made on the 22nd day of January 2015, with reference to the amalgamation of ECL Soft (Pvt) Ltd with E-Chanr elling PLC in accordance with sec. 242(1) of the Companies Act No. 07 of 2007, it is hereby announced that the gazette notification pertaining to the said amalgamation was published on this day of 13tJl February 2015, in the government gazette, in accordance with sec. 242 (3) (a) of the Companies Act No. 07 of 2007. Further, newspaper notices pertaining to such amalgamation were published in the Daily News, Dinamina and Thinakaran on the 27th day of January 1 015. The Millennium Housing Developers Plc stated to Colombo Stock Exchange that M.R Ramanan Acquire 10% of Millennium Housing Developers Plc from the Nawaloka Construction Company PLC. The purchases process was done for 13,468,132 Shares at a price of Rs 6.70 per share. At Konsept Centro (Pvt) Ltd., we aim to create an atmosphere where the house becomes your home: with carved expertise to create and innovate the best modern kitchens and furniture designs to satisfy your passion for cooking, sleeping & living spaces using Nolte (Group). 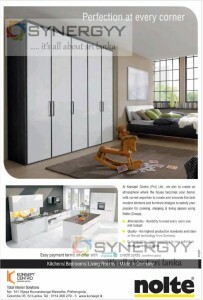 Affordability – flexibility to meet every room size and budget. Quality – the highest production standards and state-of-the-art technology from Germany. Customisation – made according to your individual needs, habits and styles. Konsept Centro is master in the intrior design in Kitchens, Bedrooms, Living Rooms from Made in Germany interiors, a special easy payment scheme available for Standard Chartered Credit Cards. For more details contact to the Konsept Centro the Total Interior Solutions on 0114 388 270 – 3 or visit to No. 141 Vijaya Kumaratunga Mawatha, Polhengoda, Colombo 05. Sri Lanka.